During the Victorian age printing became cheaper and many people could read which resulted in an explosion of literature. "Belles Lettres" or essays in which authors such as Ruskin and Thomas Carlyle gave their opinions about current debates and about art and literature, were more popular than they are now. Other novelists included Anthony Trollope, (1815-1882). Earlier poets included William Wordsworth (1770-1850), The market for childrens' books began to grow, supplied by authors such as Lewis Carrol (Charles Dodgson, 1832-1898), who wrote Alice in Wonderland and Rudyard Kipling (1865-1936) who wrote The Jungle Book, Kim and books for adults as well.) Poets were idolised by the public as film stars are today, and included Robert Browning and Elizabeth Barrett Browning, Christina Rossetti, Shelley, Keats and Byron. 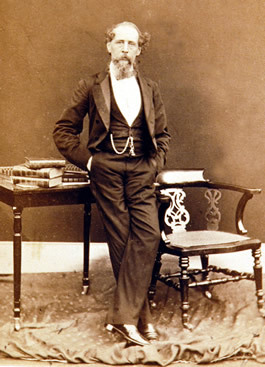 Charles Dickens wrote stories which often focused on the lives of poor people. He knew what it was like to be poor because his father often owed money and was even sent to prison because of his debts. Dickens was a journalist at first and wrote about parliamentary debates, but he soon started writing stories that the papers published in weekly instalments. People were shocked when they read what life was like for London's poor. became rich and famous in England and America. Some of his best known books are Great Expectations, David Copperfield, Nicholas Nickleby and Oliver Twist all about the lives of boys growing into young men in England. He also wrote A Christmas Carol, a story about the miser Scrooge, one of the most notorious characters in literature..